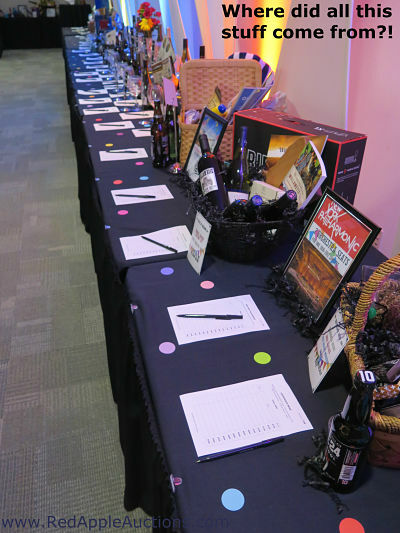 Wondering where to get charity auction items? If you’re new to auction fundraisers, you might not realize all of your options. There are three primary ways to secure items. 1. The traditional way is to ask friends, family, and businesses for donated items. This is the most common approach and generally the best because it garners you the greatest returns. The donor might give you a product from their place of business, agree to let you sell a one week stay in their vacation home, or provide a service, like baking a cake once a month for six months. You can also simply ask for a cash donation, though some volunteers find it more comfortable to ask for a donation in-kind than to ask for cash. Advantage: These items are donated. If you sell an item for $500, your nonprofit keeps $500. Disadvantage: Depending on your personal connections and ability to solicit donations, you might not have the quality of items you’d prefer to sell. Your crowd might be willing to spend more on something unique, but your procurement team might lack the personal connections to secure those items. 2. Consigned items might be used to supplement donated items. A consignment company offers hundreds of ready-to-sell items for a reduced price. Usually the charity only pays for the items that sell. Assume your charity opts to use 20 consigned items but only 10 of them are sold at the auction. Your non-profit will pay for those 10 items purchased. The difference between the consigned price and the sale price is what your charity keeps. So if the consignor offers you a signed painting for $500 and you sell it for $700, your charity keeps $200. You pay the consignor $500. Advantage: It’s easier. With one phone call, you can have your auction filled with fabulous items. And the wide selection available means you can “uplevel” your auction with some unique items. Guests can bid on one-of-a-kind experiences and products. Disadvantage: You might “miss the mark” and select items unpopular or too expensive for your crowd. Although you won’t need to pay the consignor for this blunder (remember, you only pay for what you sell), you missed an opportunity to sell a 100% donated item. Let’s borrow a term from economics: opportunity cost. The time and space that could have been spent showcasing and selling a 100% donated item was foregone in order to promote the consigned package … which earned you nothing when it didn’t sell. There is also some controversy about whether bidders should know if an item is consigned. Some bidders become irate once they learn that $500 of their $700 donation was going to pay a consignor. “I would have rather just written you a check for $700,” some say. Soliciting items is time consuming and a fair chunk of that time is spent on research. You’ll enjoy a higher response on your solicitation letters if you address your letter to a real person (not “To Whom It May Concern”) but tracking down the right person, his title, and his address takes time. Not to mention that people change jobs frequently. The contact at Company ABC who sent that great donation last year may have left her job. Now you need to find out who the new contact is and re-submit this year. If you rent a procurement database, the company who owns the database is responsible for keeping the names and addresses current. And because the database is enormous, you can can target the right businesses for your crowd. Do you think your guests will love bidding on spa packages? Use the database to send out letters to 500 international spas and see who sends you a gift certificate. Is golf a favorite among your crowd? Send 1,000 letters to golf clubs and golf merchandisers. You can lean heavily on businesses that you think your crowd will like. Once your letter is perfectly crafted, the owner of the database will mail your letters. At that point, you sit back and wait for the items to pour in. Advantage: It’s easier. Rather than spending time calling different companies and tracking down each person in charge of approving donations, the research has already been done for you. Your time can be spent crafting a compelling letter. It’s also likely that the items you secure may be more plentiful and of high quality than what you could have achieved using your personal connections. And because the items are 100% donated, if you sell an item for $700, all $700 remains with the charity. Disadvantage: There is a cost associated with renting the database. And to a great extent, this is a numbers game. The more letters you send out, the more donations you’ll receive. You can’t skimp on price and expect to do well. If you only buy a small portion of the database (such as 100 names), you won’t hit a home run in your procurement. Databases are about scale. You need to commit to buying enough access that the law of averages will kick in and you’ll get the donations you seek. For trending auction insights and rock solid fundraising advice, read Benefit Auction Ideas. This auction-centric newsletter is published every-other-Tuesday and read by subscribers globally. Wow, I didn’t know about that last one. Who knew you could rent a list of donors. Not surprised though. Thanks for sharing this, Sherry! Most business in my area are not donating $500 pieces of jewelry to events. SO, we went with the consignment option for our jewelry at our event. The jewelry brought in over $6000 of profit for our group. I would highly recommend it. Sounds like that instance worked out well for you, Angela. And one suggestion I’d offer is to not limit your search locally! Though they stopped their giveaway program in 2013, many of my clients benefited from Pearl Paradise’s necklaces. The company would donate a $500 pearl necklace to any 501(c)3 that asked. (Here’s a list of some of the charities they helped. “http://www.pearlparadise.com/giving-back-recipients.aspx) As they are announced, I share other companies that offer these programs with my clients. Perhaps your auctioneer could make suggestions for you, too. I love Sherry’s annual list of what sells!